Molissa Fenley at St. Mark’s Church. Photo by Steven Speliotis. On June 21, Molissa Fenley and Company performed Their Mark, a double bill that featured new and reconstructed work from the groundbreaking choreographer, dancer, and professor. 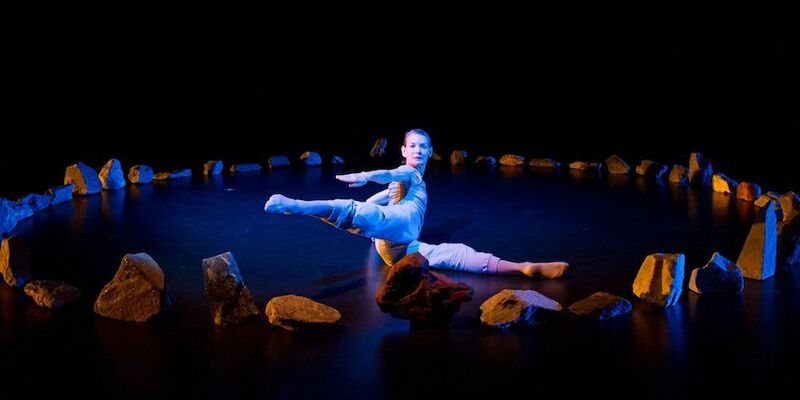 The performance included the premiere of dances from Fenley’s Water Table (2016), a lyrical meditation on the connection between human bodies and bodies of water, and how economic and political disturbances can trouble these linkages. The program, performed at St. Mark’s Church-in-the-Bowery, also featured a reconstruction of Fenley’s 1979 piece Mix. Here, Fenley’s choreography felt like unrelenting play; for some twelve minutes, the dancers bounced through geometries of space across the sprung church floor, clapping out time signatures and slamming together sand-blocks; leaning into the exertion, occasionally breaking out into joyful, delirious grins. These performances come as part of a larger process. Fenley has continued to create new works while simultaneously revisiting some of the eighty-five works which marked her earlier career, such as Floor Dances (A Requiem for the Living), a piece Fenley created after the Exxon Valdez oil tanker spilled eleven million gallons of crude oil in Alaska’s Prince William Sound. That weekend, I met with Fenley in St. Mark’s Church, both of us perched on the risers, a few hours before the final performance of Their Mark. Rachel StoneI wanted to start by asking about Water Table. I’m curious how works like this and Floor Dances respond to geopolitical and environmental injustice, while remaining abstract and impressionistic. The movement quality of Water Table, for instance, is highly technical and stylized, but also clearly is gesturing at a larger—and very specific—theme. How did you approach creating work in response to political and environmental crises? Molissa Fenley I’ll start with the Floor Dances. That was 1989, right after the Exxon oil spill. I decided to make a piece as if I were a bird encrusted in oil. I never stand up the entire time; I’m always within a circle of stones. The movement is extremely abstracted—I don’t look like a bird, but for instance, there is a hand gesture that could almost look like a beak, there’s some fast movement that could be ruffling feathers. It is and it isn’t; it’s an image I use to push myself to find a vocabulary that’s particular for this piece. I’ve been working on Water Table now for about four years, and each section has a particular vocabulary and point of view. The first piece, “Entrance,” was actually made in 2014. The dancers move around each other in this really empathic way. I felt this connected to how the human body’s relationship to water is one of absolute necessity and absolute survival, but there’s also a sense of empathy, of intimacy, of you in a bathtub or in a swimming pool, the sense of being enshrouded. The next piece, “Mali,” is a solo piece that I made using imagery from Etruscan and Greek frescos and sculptures of people carrying vessels. I grew up in Nigeria and I remember many many times where we’d go for days without water, so the idea of going someplace to get water to bring it back to your house is something I’m very used to. And now, I’m living in a country where you have an abundance of water. But there’re many places in the world where that isn’t the case—particularly Mali, a land-locked desert, where water is used as a political resource. It’s not only about necessity; the people who own it own it, and sell it at a very high price. The idea of water rights, and who owns the water, is a very political idea. The next piece that we do in this version of Water Table is called “A Pattern of the Surface.” I’m dealing with the idea of a dance poem—a realization of the beauty of a body of water and all the intercurrents: the way the colors shift, or what kind of life is on the surface. There’s a lot of braiding and patterning; it has a way of unfolding just like a body of water. The last piece is called “Sargasso Sea.” Sargasso is an area inside the Atlantic Ocean, and it’s extremely fecund. It’s like this tightly woven sea in the middle of the ocean, which itself has the properties of the sea—it’s surrounded by water and yet it’s water. RSDo you have an ideal audience reaction in mind here? To either move the audience to protect the water, or is it more of wanting the audience to reflect, and not necessarily to direct action? MFI think it’s a little bit of both. There’s a reflection of the artistry and a reflection of the craft, but that is all there to elicit the feeling of action. It’s a rare person now who doesn’t sense that water is precious. They used to say that water is the new oil—in terms of who owns it, the kind of money to be made, and the kind of exploitation. I think people are very aware of that. However, this makes you more aware. Molissa Fenley in The Floor Dances. Performance at The Whitney Museum, 1989. Photo by Paula Court. RSSo many of your dances play with this idea of unrelenting endurance. The original version of Mix is forty-six minutes long, your 1980 work Energizer is only a bit shorter, and State of Darkness, which you created in 1988, is maybe the most striking example of taking on a demanding and punishing score—Stravinsky’s “The Rite of Spring”—and dancing the entire thirty-five minutes as a solo piece. These pieces require dancing to the point of complete exhilaration, and maybe exhaustion. In new works, are you still working with that theme? MFI really like the idea of continuing. I don’t like the idea of a dance starting and just being really short. I find, physically, that the metabolic change that takes place in moving for a long time is really interesting. It opens your brain in different ways. There’s this sense of continuity; you see one dancer in Part I and then you see her back in Part III. I’ve always found that I love starting at the beginning and being there at the end. I like being in everything, though right now, it’s not such a good idea for me to do that. But that’s always been my M.O.—to be in absolutely everything, all the time. That’s changing a little bit, because it’s just physically really difficult to do that. But the desire is there; wanting to be in it, wanting to be enveloped in it. Like a desire, or almost like a greed. The sharing of the space is one of the things that I really like about being in the dance too. The realization that you together are making this entity, whatever it is. It’s very dependent upon what [the dancers] bring to it. I don’t teach a technique course, I don’t say “do it this way.” There’s a physical reality that each person, from their training, comes to the rehearsal with. And along with that is an ideal state of the mind saying, “Look at that movement, how do I do it, what do I do?” Then finding ways to copy it, and then eventually it becomes like second nature. In Mix, the last piece [in the Danspace Project performance] from 1979, there’re four dancers together, undergoing all these different rhythmic variations and patterns. Something gets made from that; something evolves, rather than just the steps. There’s this real sense of a community, or that each person is really depending on the other three, and yet this person is an individual. There’s an exhilaration in that, a feeling of belonging in something. The dancers belong to each other, and they belong to the rhythm. MFYou see the smiles start to come, these knowing looks with each other—it’s really great. Molissa Fenley in The Floor Dances. 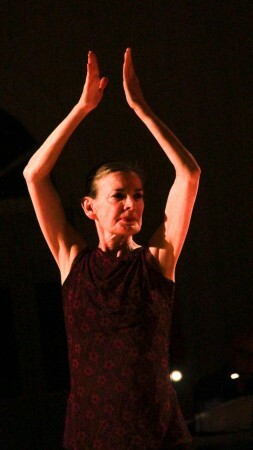 Performance at New York Live Arts, 2013. Photo by Ian Douglas. RSI’m wondering how you approach reconstructing certain dances, and which of your pieces you choose to work with, revise, and see again. What informs your decision? MFI’ve been interested in looking at my very early work. I’ve almost reconstructed everything from 1979-86, which were certainly my formative years of making work. I decide to reconstruct them because no one gets to see them if they’re not being danced; they’re just in a box on the shelf. I’m really interested in embodying my early work, physically, since I am still able to do what I did then. To be sixty-three years old dancing something that I made when I was twenty-three… it’s like a time warp. And I like bringing back some of my work from the ‘90s and seeing it against my new work, because you really see a conversation. You said “revise,” and it’s interesting—when I reconstruct these pieces, I really do them verbatim. I don’t have any judgement about what it is. I really do it as it is, religiously, and methodically. RSWhen you’re re-embodying dances that you performed or that you created after a span of time, how does it feel when the context and the political reality of the work changes? MFFloor Dances was in response to a dire situation, and I can’t say that situation is less dire. There are oil spills everywhere. My husband is from Santa Barbara and we’re there often. And just recently, there was a huge oil spill; the entire shore was devastated. RSIt stays relevant, whether you want it to or not. MFYeah. And that’s another part of the relevancy; if you think of the Floor Dances as telling people to look… Well, no one’s looked. Or, the culture doesn’t look. Or the corporations don’t look. Now we have a president who’s getting rid of all the regulations, so it will continue. RSAnd do you see your work in the future continuing to grapple with this? MF I think so, because it’s a real need for me to make sure that I address something about the environment. All my work is about nature and about love. It’s already right there. The pinpointing of the particularity of a work—saying “this is about water”—it doesn’t necessarily have to be about the water problem. There’s a huge island of plastic bottles in the Pacific, bigger than Rhode Island. It’s just plastic debris, from currents, all adhered to each other. And all the sea life underneath that can’t breathe. Every time you turn around, there’s something the EPA is doing, or Trump is personally doing, to eradicate the kind of environmental advocacy work that has been done in the last forty years. Things were going pretty well. Now all this stuff—it’s unfathomable. RSParts of Water Table left me with the feeling that this relationship between humans and nature is itself something that could be lost. MFIt feels that way, doesn’t it? Molissa Fenley’s Floor Dances (Requiem for the Living) will be presented by Richard Move at the University of Malta from July 5-8 as part of the conference Contra: Dance & Conflict. Rachel Stone is from Chicago and currently based in Brooklyn. Her work has been published by The New Republic, Real Life Magazine, The Awl, and other publications.